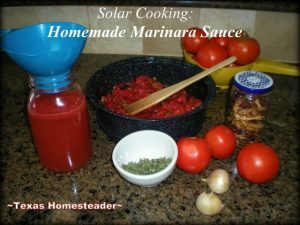 Solar Cooking: Homemade Marinara Sauce Cooked OUTSIDE! Several months back I bought my very first solar oven – I’m in LOVE! I’ve used it to cook bread and dehydrate garden veggies, but today I’m going to use it to cook homemade marinara sauce. All the recipes I saw instructed you to cook your garden tomatoes for up to 3 hours to thicken the sauce – It’s hot & humid here in NE Texas and simmering a pan on the stove for that length of time didn’t appeal to me at all. Luckily I didn’t have to, the solar oven did a fantastic job and all the cooking heat was left outside where it belongs! I harvested the available fresh garden tomatoes from my garden and brought them inside. Then the tomatoes were washed, cored & halved them and I threw them in the freezer overnight to freeze them. Here’s ya a helpful hint – you don’t have to boil the tomatoes to skin them if you freeze them like I did. I simply pulled them out of the freezer and allowed them to semi-thaw and the skins slipped right off. Again NO HEAT ADDED TO THE HOUSE! I allowed them to drain for a bit and I saved the tomato juice for other uses. Then I cut the tomatoes into chunks. I added a couple of cloves of minced garlic, some crushed dehydrated oregano from my garden. And since I didn’t have any onions left in the garden I used the ones I dehydrated from the garden earlier. About 1/2 bell pepper was chopped & I stirred it all together & placed in a black enameled pan and set it into my solar oven. The solar oven’s glass lid was left unlatched to allow the moisture to escape. Of course I adjusted the oven toward the sun about every hour to help it track the sun across the sky. The Sun-Tracker Cube makes it easy for me to know when my oven is adjusted to the highest efficiency. The temps inside the solar oven stayed about 300 – 350 degrees. By the end of the day I brought my homemade marinara inside, salted to taste and enjoyed it over multicolored pasta. There’s enough sauce left over to enjoy it later in the week on my homemade meat-stuffed ravioli. Yessireebob I love my solar oven! For those asking me which one I bought, I bought this *Sun Oven and I have nothing but good things to say about it – love it! 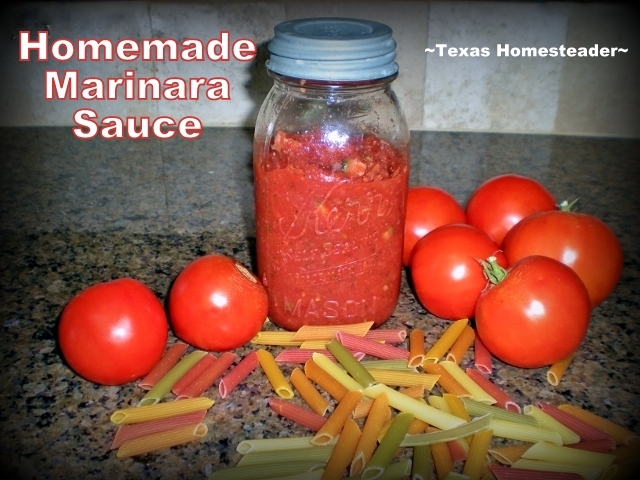 I enjoyed cooking up this delicious sauce without adding any heat in our living space. The sauce was delicious! Looking For More Solar-Cooking Recipes? This entry was posted in Blog Posts and tagged Cooking, Environment, Frugality, Make-It-Yourself, Solar Cooking, Summer, weather on September 15, 2013 by Texas Homesteader. I love that solar cooker. Your sauce looks yummy. Thank you for sharing with us at #HomeMattersParty. See you again next week. I was talking to my husband about this, beacause I feel like this is something everyone should have. It’s a great post and love that you shared. That solar cooker is amazing – Thanks for sharing on the What’s for Dinner Link up. I’m so intrigured by this solar oven. And that marinara sauce looks amazing! Thanks for sharing at the #WasteLessWednesday Blog Hop! I’m pretty fortunate to live in NE Texas Margy – Although it’s cold it’s often still sunny so I use my solar oven even in wintertime. Nice thing about that solar oven; it should have no problem cooking with it in this Texas heat. I was out digging up irises and finally had to quit. It’s hot out there. After getting stung by 2 wasps and getting into a fire ant hill I figured it was time to call it quits for the day. Way Cool idea! Thanks for sharing on My 2 Favorite Things on Thursday!! Hope to see you again this week!! I pinned this to My 2 Favorite Things Pinterest Board! Well, I’m going to have to get a solar oven! I know I love mine Julie! I have been following your articles about using a solar oven. I would love for you to write an article about how you set up and actually use the oven. I am very interested in purchasing one myself and would like to hear thoughts and comments from you. I love my solar oven Taryn but although I’ve done several posts on recipes I’ve used the oven for, I’ve never done an article on its actual use. That’s a great idea! Keep an eye out for an article soon. Living right next door in Louisiana I should get one. How long does it take to heat up? Do you have to wait for it to heat up? Thanks for sharing. I love my solar oven Joyce. The oven heats up remarkably quickly – especially on a sunny cloudless day (seems we have LOTS of those!) I don’t always wait for it to heat up – if I’m making a casserole or main dish I’ll just pop the filled cookware in and let it get started. The only time I allow a pre-heat is if I’m baking bread in it or something like that. Most times for the things I cook there’s no need for a pre-heat. Hi Tammy! I’ve had my Sun Oven outside twice this week! The sun is perfect for cooking here in Alabama, this time of year! Thanks for sharing! Blessings from Bama! I love my solar oven too. It’s so hot here in AZ that I can’t bear to have the oven on in the daytime in the summer so out it goes, either in the solar oven or the crock pot on the porch. We’ve had some killer roasts and pork chops w/veggies (in another pot so one wasn’t too overloaded. I just checked your link they won’t ship out here hopefully I can get something here, I’ve decided that’s my Next birthday present. Sun oven, awesome! I read a book about solar cooking awhile back but didn’t think much of it afterwards because it looked difficult to implement. Love seeing someone use it and make it look easier! That is so cool! I’ve been hearing more about solar cooking but haven’t tried it yet. I’m thinking maybe my husband can make a solar dehydrator to try out first 😉 My birthday is in July…it’d be perfect! I too have a solor oven. I use it on our 32 foot live aboard sailboat. I have made bread and cooked chicken in it. You have to stay focused on it to make the dishes good. I would like to link with others who use the solar over (exactly the same as yours) for information and cooking ideas. Thanks.